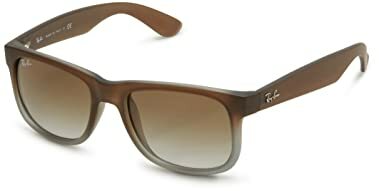 Undoubtedly, Ray-Ban is the iconic and original eyewear brand that everyone has heard of. 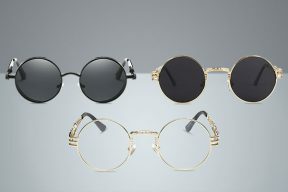 Since its first commercial product in the 1930s, the company continues to gain more reputation and popularity in high quality and stylish sunglasses. If you consider yourself a sunglasses-holic, you should own at least 1 pair of Ray-Ban sunglasses in your collection. 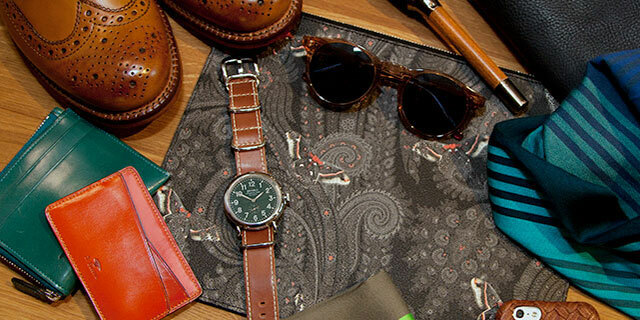 In case you are on the hunt for your new pair of sunglasses, Ray-Ban and its products should be on top of your list. With fully customized sunglasses, you have thousands of choices to choose from on the market. Take a look at the list below for the best of the best. 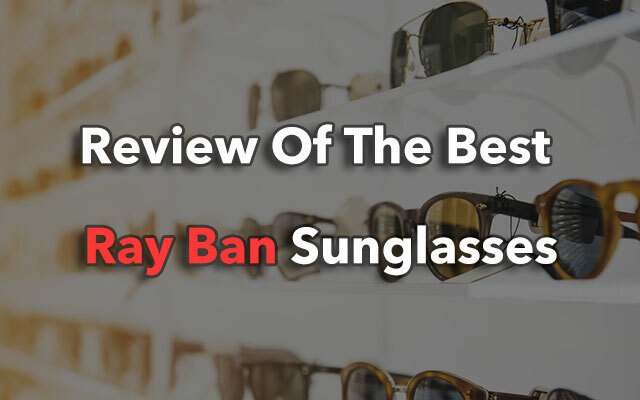 Here is the review of the best Ray-Ban sunglasses in different styles – the Aviator, the Wayfarer, the Clubmaster, the Round and the Justin design. In case you are looking for a timeless and classy model of sunglasses, this style should always be your first choice. 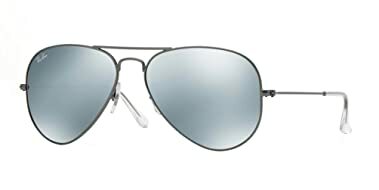 The design of these Aviator glasses comes with large lenses and thin frame for the aviator styling. It goes well with all types of face’s shape- oval, round or rectangle. 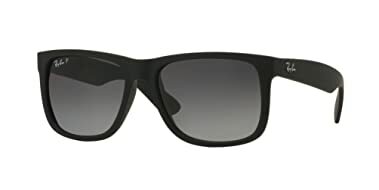 Their Main Features: This pair of sunglasses is made with gunmetal frame and solid black lenses. The width of each lens is 58 millimeters and the height of it is 50.1 mm. The length of the bridge is 14 mm and the length of the arms is 135 mm. The colors of the lenses are grey and black. The lenses of this pair of sunglasses are polarized. In addition, they are 100 % of UV 400 protection coating. It is the perfect pair of sunglasses to wear under the sun. The sunglasses arms can be easily adjust to bring you a more custom fit. I think that the dark color of the lenses might obscure your sight, especially when it is getting cloudy or when the sun sets. 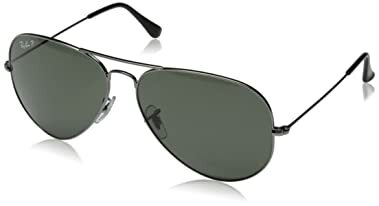 Their Main Features: This pair of sunglasses is made with metal frame and crystal green polarized lenses. There are 3 different colors of frame for you to choose from including the gold frame, the black frame and the gunmetal one. The width of each lens is 58 millimeters. Lenses are G15. It is very lightweight and comfortable on your face. Also with high quality nose guards, the sunglasses also sit comfortably on your nose, causing no irritation at all. There are quite a few of colors for the frame for you to choose from to match with your skin tone and the colors of your hair. The thin frame of this pair of sunglasses can break easily if you don’t handle them with enough care. Their Main Features: This pair of sunglasses is made with metal frame and crystal lenses. The width of each lens is 58 millimeters. The length of the bridge is 14 mm and the length of the arms is 135 mm. The lenses are in mirror silver color. The color of the lenses is not too dark so that you don’t have to worry that it reduces your ability to see. While the frame is quite flexible, it is also sturdy and durable. You can match this pair of sunglasses with both of your casual and smart styles. The lenses of this pair of sunglasses are not polarized, which might not be suitable for one who has to drive a lot. Unlike the Aviator style, the Wayfarer style gives out a totally different look with much more substantial frame and smaller lenses. 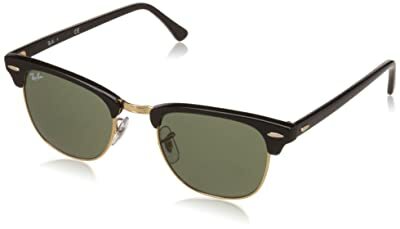 Along with the Aviator design, they are two most traditional and classic styles of Ray-Ban. It goes well with a wide range of face’s shape, from oval, to round face. You can also wear this design of hat with your street wear style, casual style and smart style. Their Main Features: This pair of sunglasses is made in resin/ plastic frame and glass lenses. The width of each lens is 55 millimeters. Other options of width for you to choose form are 52 mm and 58 mm. The length of the bridge is 18 mm and the length of the arms is 145 mm. The lenses are in many colors such as beige, black and tortoise. For this model of sunglasses, you have a wide range of lens width, lens colors and frame colors to choose from. The lenses come with 100 % of UV protection coating. 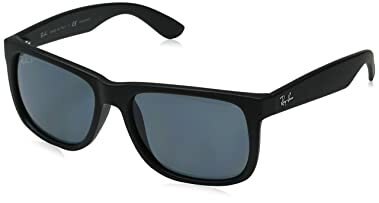 The lenses of this pair of sunglasses are non-polarized so that your eyes are not protected from the glare, especially when you have to drive in a bright sunny day. Their Main Features: This pair of sunglasses is made from 100 % of nylon with acetate frame and plastic lenses. The width of each lens is 54 millimeters and its height is 46 mm. The length of the bridge is 18 mm and the length of the arms is 150 mm. There are 3 options of colors for you to choose from including black, violet and tortoise. The lenses come with 100 % of UV protection coating. The frame of this pair of sunglasses is made from high quality nylon fiber to be very lightweight and flexible. You can easily adjust the frame for a more secure fit. The lenses of the sunglasses are of high quality which is very durable. They are also less prone to scratches. In my opinion, the material of this pair of sunglasses makes it look quite casual rather than smart. Their Main Features: This pair of sunglasses is made with rubber frame and glasses lenses. You can choose two option of the lenses’ width, one in 51 mm and one in 55 millimeters. The length of the bridge is 16 mm and the length of the arms is 145 mm. You can choose from several colors for your lenses including blue, orange and black. 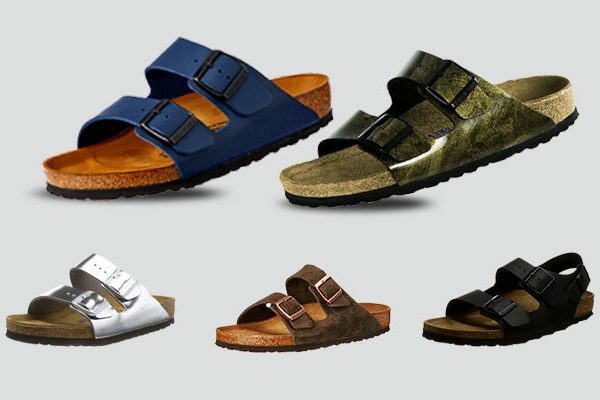 They come in many bright and unique colors that would make you stand out from the crowd while wearing them. The lenses of this pair of sunglasses are prescription ready. It means that they are RX able. It is definitely good news for anyone with eyesight problem. It has a good protection as the tint is adequate with good polarization. 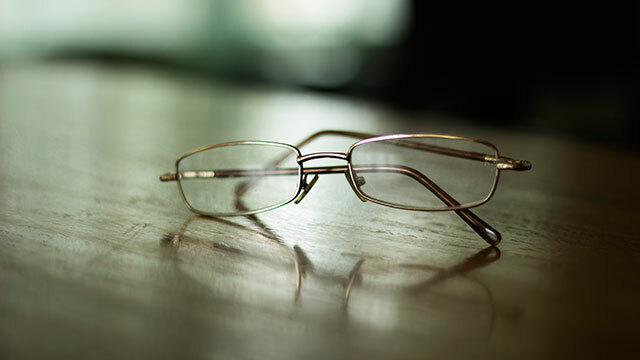 After using all kinds of frames with different materials, I have come to the conclusion that rubber frame is the hardest to care for as it is very sensitive to light, heat and oil from our skin. In case you want to have a more modern style of sunglasses with still a touch of the vintage look, you can look at this design. 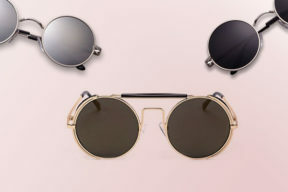 With a pair of sunglasses in this design, you would have a large round lens with larger and even more substantial upper rims, which is well known as the browline. People with the face’s shape such as heart and oval shape would find that this style can enhance their natural features significantly. 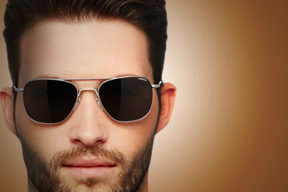 Their Main Features: This pair of sunglasses is made in metal frame and glass lenses. The width of the lenses is 49 mm and the height of them is 49 mm. The length of the bridge is 21 mm and the length of the arms is 140 mm. The frames are in many colors such as Sand Havana and Ebony. The lenses of this product are polarized with 100 % of UV protection coating to protect your eyes effectively from glare and harsh sun rays. It comes with an adjustable nose pads for your most comfort while the sunglasses sit on your face. You have a lot of choices for different frames’ design and lens’ colors to match with your skin tone, your hair color and your personal preference. In comparison with other pairs of Ray-Ban sunglasses, this pair seems a little bit heavier. Their Main Features: This pair of sunglasses is made with plastic frame and synthetic lenses. The width of the lenses is 51 millimeters while the height of the lenses is 43 mm. The length of the bridge is 21 mm and the length of the arms is 145 mm. The lenses are in dark grey color. With the color and the high quality of the lenses, you would be able to see through these lenses without any difficulty. Not only can this pair of sunglasses be used for all types of weather conditions and activities but it also helps to reduce tiredness in your eyes when you have to look at something for too long. The sunglasses are lightweight and sit comfortably on your nose. This pair of sunglasses only comes with one option of colors, one lens size and frame for you to choose from. 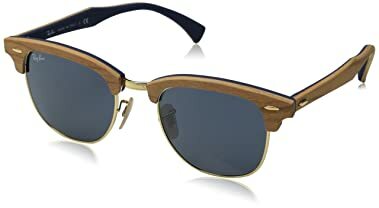 Their Main Features: This pair of sunglasses is made in wood frame and plastic lenses. The width of the lenses is 55 millimeters. The length of the bridge is 21 mm and the length of the arms is 145 mm. The lenses are in many colors such as beige, black and tortoise. 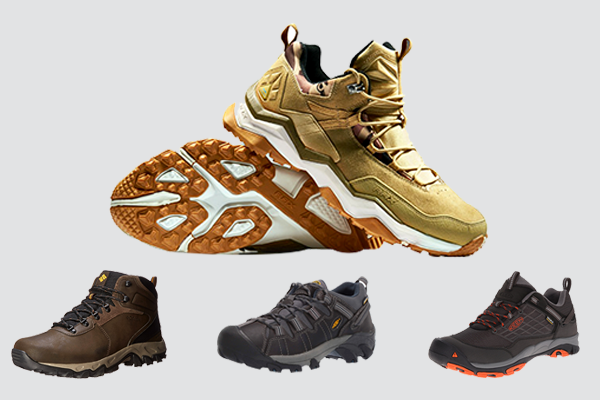 This product’s line offers you a huge selection of frame’s colors to choose from such as brown, black and gold. The high quality of the lenses along with their color help you to see better and make your eyes relaxed even when you have to use them for a long time. The wood frame is less flexible than other types of frame. It also heavier and easier to snap when it is bent. You can easily recognize this design of sunglasses thanks to its unique frame. It comes with round lenses and a round frame. The frame is quite thin when you compare it with the frame of the Wayfarer. The nose bridge and the arm of these glasses are thin as well. 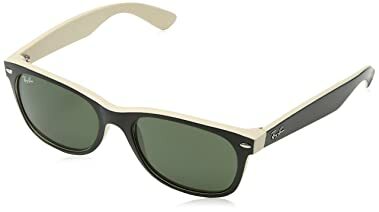 John Lennon is the most famous celebrity I can think of who wear this design of Ray-Ban sunglasses. Their Main Features: This pair of sunglasses is made with plastic frame and glasses lenses. The width of the lenses is 50 millimeters and the height of them is 46.8 mm. The length of the bridge is 21 mm and the length of the arms is 145 mm. The lenses are comes with 100 % of UV protection coating. The plastic frame is durable and has a good “memory”. Even though when you bend its shape, it will spring back to its original design. 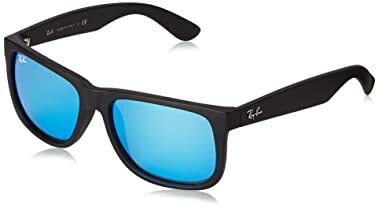 The classic style and solid color of this product all contribute to a versatile pair of sunglasses for you to wear in many styles such as smart style and street wear style. With this pair of sunglasses, your visual depth as well as your ability to look far ahead is increased. While the glasses lenses of this product are durable and less prone to scratch, the material makes the sunglasses heavy. Their Main Features: This pair of sunglasses is made with metal frame and plastic lenses. The width of the lenses is 48 millimeters and the height of the lenses is 46.9 mm. The length of the bridge is 21 mm and the length of the arms is 145 mm. 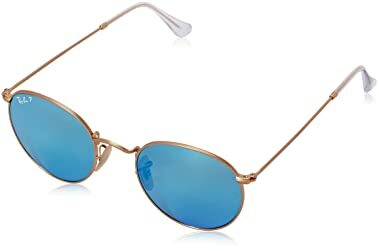 The lenses are bluish color with gold frame. 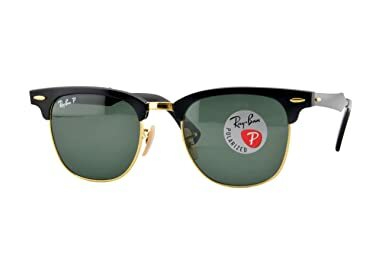 With the bright and unique color on the lens and the frame, this pair of Ray-Ban Round sunglasses brings a trendy and aesthetical look to the wearer. It helps to reduce glares and enhance the color perception for you effectively, even when it is super bright and shiny outside. The construction of the sunglasses is solid, sturdy and super durable. The color of the lens is best used in certain kinds of conditions only such as when it is foggy or snowy. It doesn’t give a good vision when it is sunny or cloudy. Their Main Features: This pair of sunglasses is made with metal frame and plastic lenses. The width of the lenses is 55 millimeters and the height of the lenses if 55 mm. The length of the bridge is 21 mm and the length of the arms is 145 mm. The lenses are available in crystal green color with gold frame. 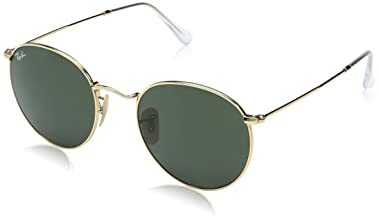 Unlike the sunglasses with yellow or blue lenses the crystal green color is good to use for all types of conditions (sunny, cloudy and snowy. The pair provides a good contrast when the light is getting low. The construction of this pair is very sturdy and solid. The metal frame is a little bit heavy but it can stand well against external factors such as shocks and scratches. The lenses are not polarized, which would not reduce the glare your eyes have to encounter. Finally, if you aim for a more modern and funkier design of sunglasses, it is time to look for the Justin design. This design would give you a little bit of edgy look with a bold frame and semi transparent color. One significant feature of this pair of sunglasses is the rubberized finish on the frame. This style can go well with a lot of face shapes such as rectangle or round face as the curve of the frame can bring more sharpness to those face’s shapes. Their Main Features: This pair of sunglasses is made with plastic frame and plastic lenses. The width of the lenses is 55 millimeters and the height of the lenses is 40 mm. The length of the bridge is 16 mm and the length of the arms is 145 mm. The frame is available in 2 colors including black and Havana rubber. The lenses are available in many colors such as dark blue, grey gradient and brown gradient. 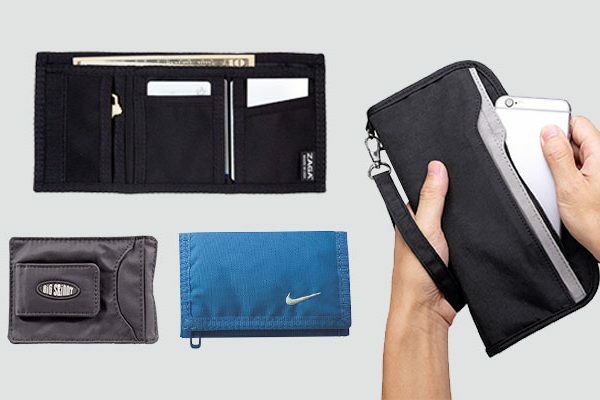 With this product line, you have 6 different choices of color combination to choose from depending on your style. 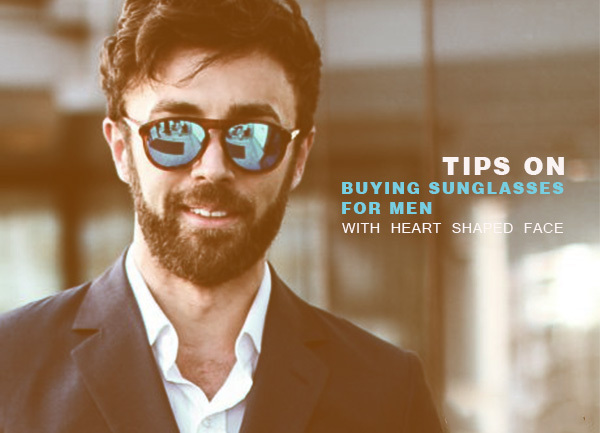 The frame of the sunglasses is durable and can retain its shape well under certain pressure. 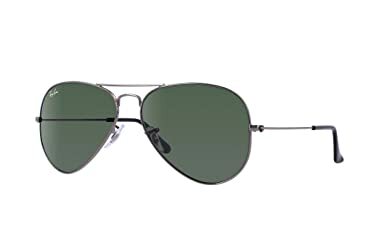 It is worth mentioning that these lenses of a pair of sunglasses are well polarized with 100 % of UV protection coating to protect your eyes and helps it see better when it is sunny outside. This pair of sunglasses is less resistant to scratch in comparison with other types of materials such as glass or metal. Their Main Features: This pair of sunglasses is made with plastic frame and synthetic lenses. The width of the lenses is 51 millimeters and the height of the lenses is 42.3 mm. The length of the bridge is 16 mm and the length of the arms is 145 mm. The lenses are available in different colors including Blue mirror, Gold and green gradient. The colors of the frame are rubber brown and black. This pair of sunglasses comes with solid but flexible frame. You can easily have the shape and curvature of your pair adjusted to give you a better fit. The colors of the lenses help you to have a better perception of the colors of things around you, especially when it is getting darker outside. Please notice that the length of the bridge nose of this case is 16 mm, meaning that it runs a little bit smaller than other designs and styles of Ray-Ban sunglasses. Their Main Features: This pair of sunglasses is made with metal fame and composite lenses. The width of the lenses is 57 millimeters. The length of the bridge is 16 mm and the length of the arms is 145 mm. The color of the frame is rubber black while the color of the lenses is grey gradient. This product is good to use for multiple purpose- when you drive, go fishing or take part in any outdoor activities. The high quality material of the lenses helps to reduce eye fatigue and provides a true perception of the surrounding’s colors. In addition, this pair of sunglasses looks very simple yet stylish and trendy, which you can incorporate with a lot of clothes in your wardrobe. This pair of sunglasses comes with one option of color in the frame and lenses for you to choose from. 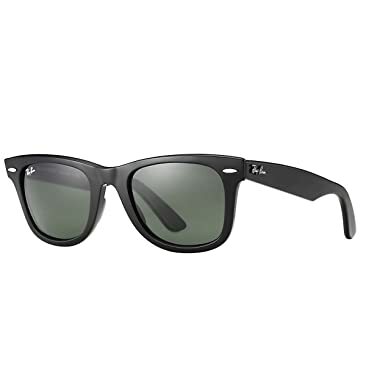 Ray-Ban is one of the most iconic, popular and reputational eyewear brands. While the price of a pair of Ray-Ban sunglasses is premium, it is definitely worth investing in a high quality, stylish and durable pair. 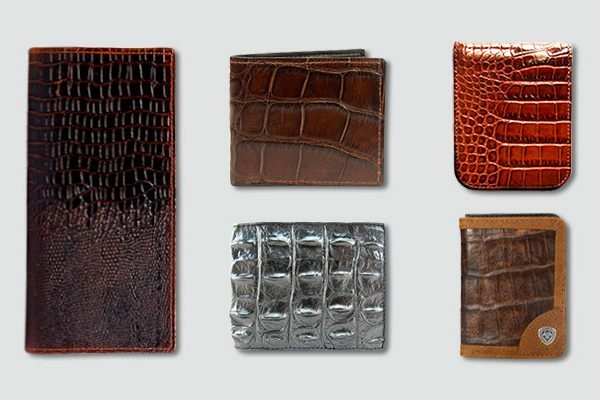 You will see yourself wearing this for a lot of occasions and incorporating it to many of your styles for a long time. They are truly classy and timeless, making your investment worthwhile in the long run. 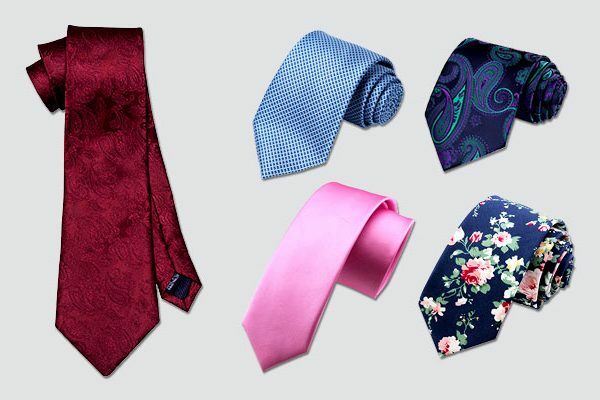 With a wide ranges of colors, materials and styles to choose from, all you need is a little of homework and research and I am sure that you can find your perfect match eventually. How can you fix the broken glasses?